Chicago Fest Crowd at Emo Nite LA. CHICAGO - Emo Nite LA performed at the Wicker Park Fest on Friday, July 27th, 2018. Emo Nite has origin in three friends (Babs Szabo, T.J. Petracca and Morgan Freed) performing at a small dive bar, and has grown into a full-blown phenomenon. Of course, they have been able to bring together some of the most incredible names in music who have become part of this Emo Nite “family”… including Halsey, Sonny Moore (Skrillex) & From First to Last, Chris Carrabba (Dashboard Confessional), Mark Hoppus (Blink 182), Post Malone, Demi Lovato and so many more. 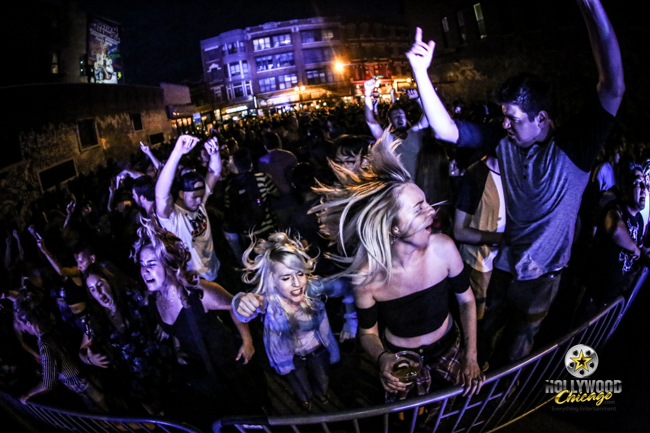 They have been able to throw regular events in dozens of markets across the country, and have had spots on lineups at festivals like Life is Beautiful, Slam Dunk, BUKU and Vans Warped Tour. They have created successful clothing collabs with companies like OBEY, Urban Outfitters, PLEASURES, Rose in Good Faith, OWSLA and more. But above all else, they are ever changing the idea of what a music event can be. CHICAGO – There are only a few times that I have left a film mentally shouting, “Won’t someone think of the children?” Not through some self-righteous religious fit, of course, but through a general concern for the animated films created for our young. “Smurfs: The Lost Village” is either made for a specific crowd in mind or made for a crowd without a mind.